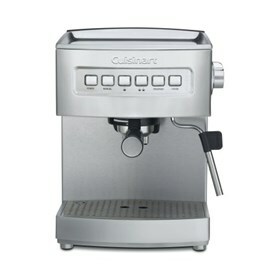 The Cuisinart EM-200 Programmable Espresso Maker prepares coffeehouse-quality espressos, cappuccinos, and lattes. This high-quality machine is designed for home use but has all the accoutrements of the professional versions, with 15 bars of pressure from a high-quality pump that runs at 1000 watts for the right amount of water pressure. The EM-200 has a water tank that holds 69 ounces and can be removed for easy cleaning and filling. It features pre-programmed cup size set at 1.5 ounces and 3.0 ounces, with the option to select the serving size you desire. Other highlights includes a stainless steel steam wand, removable drip tray and cover, and cup-warming surface on top. The Cuisinart EM-200 has many exciting features for users of all types. See the Cuisinart EM-200 gallery images above for more product views. The Cuisinart EM-200 is sold as a Brand New Unopened Item.